Leslie C. Moore is an associate professor of Foreign, Second and Multilingual Language Education and Language, Education and Society in the Department of Teaching and Learning. As an applied linguist and a linguistic anthropologist, her research examines the social and cultural patterning of learning and language development in communities whose members use multiple languages and participate in multiple learning traditions. 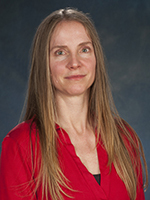 She specializes in language socialization research, an ethnographic and interactional discourse analytic approach to the study of human development and learning. Moore’s interest in multilingualism and double schooling (participation in both secular and religious schooling traditions) grew out of her experiences as a Peace Corps volunteer in Cameroon, where she later conducted research in rural and urban communities. In her newest research, she seeks to advance the knowledge and awareness of needs and practices related to informal science programming for young children who are learning English as an additional language. This project builds on Moore’s work in the Somali community in Central Ohio. It also builds on her work at Columbus’ Center of Science and Industry (COSI) as Educational Director of the Buckeye Language Network Language Pod, a space that provides the public with a research-in-real-time experience and learning activities grounded in the language sciences. Moore’s work has appeared in anthropological, linguistic, educational research and interdisciplinary journals and reference works, including Text and Talk, Social Analysis, Language Arts, Language and Communication, The Handbook of Socialization,The Handbook of Language Socialization, The Anthropology of Learning in Childhood, The Encyclopedia of Language and Education, and Early Childhood Science Education. Her research, outreach and engagement have been funded by the National Science Foundation, Fulbright, the Ford Foundation, the Spencer Foundation, and the National Endowment for the Humanities. Moore, L. C. (2017 online). Multilingual socialization and education in non-Western settings. In P. Duff & May, S. (Eds. ), Encyclopedia of language and education (3rd ed. ), Vol. 8: Language socialization. New York: Springer. Moore, L. C. (2016). Change and variation in family religious language policy in a West African Muslim community. Language Policy, 15(2), 125-139. Moore, L. C. (2016). Moving across languages, literacies, and schooling traditions. In V. Lytra, D. Volk, & E. Gregory (Eds), Navigating Languages, Literacies and Identities: Religion in Young Lives, pp. 126-140. Oxford, UK: Routledge. Wagner, L., Speer, S. R., Moore, L. C., McCullough, E. A., Ito, K., Clopper, C. G., Campbell-Kibler, K. (2015). Linguistics in a science museum: Integrating research, teaching, and outreach at the Language Sciences Research Lab. Language & Linguistics Compass, 9(7), 420-431. Moore, L. C. & Smith, M. M. (2015). Chapter 15: Science education for young emergent bilinguals. In K. Cabe Trundle & M. Sackes (Eds), Research in Early Childhood Science Education. New York: Springer. Moore, L. C. & Park, S. H. (2014). “Something for linguists”: On-the-fly grammar instruction in a Dutch as foreign language classroom. L2 Journal, 6(1), 1-20. Rogoff, B., Moore, L. C., Correa-Chavez, M., & Roberts, A. L. D. (2014). Children develop cultural repertoires through participation in everyday routines and practices. In J. Grusec & P. Hastings (Eds. ), Handbook of Socialization, 2nd edition, Theory and Research, pp. 472-498.. New York: Guilford Press. Moore, L. C. & Smith, M. M. (2014). Science education for young emergent bilinguals. In K. Trundle (Ed), Research in Early Childhood Science Education. New York: Springer. Moore, L. C. (2013). Qur’anic school sermons as a site for sacred and second language socialisation. Journal of Multilingual and Multicultural Development, 34(5), 445-458. Moore, L. C. (2013). Double schooling in Northern Cameroon and Central Ohio. In S. Blum (Ed), Proceedings of Learning In and Out of School: Education Across the Globe. Notre Dame, IN: Kellogg Institute for International Studies. Moore, L. C. (2012). Muslim children¹s other school. Childhood Education, 88(6). Moore, L. C. (2012). Language socialization and repetition. In A. Duranti, E. Ochs, & B. Schieffelin (Eds), Handbook of Language Socialization, pp. 209-226. Malden, MA: Blackwell. Moore, L. C. & Joseph, L. (2011). The OSU K12 Teacher Somali Workshop Project. Bildhaan: An International Journal of Somali Studies, 11. Moore, L. C. (2011). Moving across languages, literacies, and schooling traditions. Language Arts, 89(2), 288-297. Moore, L. C. (2010). Language socialization and second/foreign language and multilingual education in non-Western settings. In P. Duff & N. Hornberger (Eds. ), Language Socialization (pp. 175-185). New York: Springer Reference. Moore, L. C. (2010). Learning in schools. In D. F. Lancy, J. Bock, & S. Gaskins (Eds. ), The Anthropology of Learning in Childhood (pp. 207-232). Lanham, MD: AltaMira Press. Moore, L. C. (2009). On communicative competence…in the field. Language & Communication, 29(3), 244-253. Moore, L. C. (2008). Body, text, and talk in Maroua Fulbe Qur'anic schooling. Text & Talk, 28(5), 643-665. Moore, L. C. (2008). Language socialization and second/foreign language and multilingual education in non-Western settings. In P. Duff & N. Hornberger (Eds. ), Encyclopedia of Language and Education, Volume 8: Language Socialization (pp. 175-185). New York: Springer Reference. Rogoff, B., Moore, L. C., Najafi, B., Dexter, A., Correa-Chávez, M., & Solís, J. (2007). Children's development of cultural repertoires through participation in everyday routines and practices. In J. Grusec & P. Hastings (Eds. ), Handbook of Socialization (pp. 490-515). New York: Guilford Press. Moore, L. C. (2006). Learning by heart in Qur'anic and public schools in northern Cameroon. Social Analysis: The International Journal of Cultural and Social Practice, 50(3), 109-126. Moore, L. C. (2006). Changes in folktale socialization in a Fulbe community. Studies in African Linguistics, Supplement 11, 176-187. Moore, L. C. (2005). Language socialization, in Linguistic Anthropology, A. Sujoldzic (Section Ed. ), Encyclopedia of Life Support Systems (EOLSS). Oxford, UK: UNESCO. Moore, L. C. (2004). Second language acquisition and use in the Mandara Mountains. In G. Echu & S. Gyasi Obeng (Eds. ), Africa meets Europe: language contact in West Africa (pp. 131-148). New York: Nova Science. Moore, L. C. (2002). Language mixing at home and school in a multilingual community. In J. E. Alatis, H. E. Hamilton & A.-H. Tan (Eds. ), Proceedings of the Georgetown University Round Table 2000 (pp. 135-140). Georgetown: Georgetown University Press. Moore, L. C. (1999). Language socialization research and French language education in Africa: a Cameroonian case study. The Canadian Modern Language Review, 56(2), 329-350. Moore, L. C. (1999). Secondary language socialisation in a multilingual context: incongruence between community and classroom practice. Acquisition et Interaction en Langues Etrangères, 1, numèro spècial, 143-153. Somali History, Language, and Culture: A Workshop. Ohio State University Foreign Language Publications (2013). Somali Studies for Educators. Online resource for educators and other professionals who work with Somali children, youth, and families.